Furnaces, boilers, Air conditioning, spacepak, ductless and all other residential HVAC relatated..
We are a family owned business and we believe that word of mouth advertising is the best kind. We treat our customers the way we would like to be treated, and this approach to doing business has enabled us to steadily build on our reputation as one of the leading heating and cooling contractors in Chicago. Besco Air…Large enough to serve–Small enough to care. Great, professional service and helpful at every step. Highly recommended! Knowledgeable, professional staff all the way. Will gladly hire Besco again and recommend. These guys really know their stuff. The moment I met Joe, I knew I would use them to replace my large capacity boiler. They were fast, efficient, and stayed until the job was completed. They explained everything at every step of the way, and even changed out the incorrect existing plumbing. They were friendly and very knowledgeable. I am truly impressed with the service and quality of work. For sure we will have them back again to service/replace AC units. Thank you Besco! It has been an absolute pleasure dealing with Besco. A terrific team. I was out of the country on December 26th,2018 (record low temperatures)when my son-in-law walked into my home and found the heating system had failed. Joe Pedota came that day, and installed a new system the following morning. The follow up service has been outstanding. I highly recommend Besco. Excellent company with great customer service, I'll be using them long into the future! Great service, knowledgeable technicians. Highly recommend. Besco was on time, friendly, professional, and did a great job checking my furnace. The service tech put "covers" on his shoes so that he would not bring any dirt into my home. They give fabulous service and I would recommend them to everyone!! Everyone at Besco Air is very professional and knowledgeable. I highly recommend their first class service! I called Besco this morning cuz my A/C compressor gave out overnight. Technician Rob came out amazingly fast and diagnosed the trouble and got me up and running in no time. Before Rob fixed the trouble, he came and explained what was wrong. Very professional service at a very reasonable price. I highly recommend Besco and Tech Rob. Big thumbs up! Excellent customer service and quality work when you choose besco. The Besco crew were quick, professional and did great work. They finished the job a full day early, and responded quickly to any hint of an issue. I highly recommend them! Being a single female, I am cautious on who I hire to come into my house. The company was professional, prompt and personable. Sergio was the tech who had my issue diagnosed and within an hour had a price to fix. He went so far as to retrieve a part and come back the same day. This was an expensive fix (1250$) but I felt every bit comfortable with the pricing and installation. I now have Air Conditioning again. I highly recommend Besco! I really wanted to get air conditioning installed but dreaded the idea of having the house torn up and dealing with sales guys and installers making a mess. I know I’m generalizing. My experience with Besco was the exact opposite. I had eight estimates (I know a bit excessive but there's a reason) but I feel very sure I chose the right one. Joe the first point of contact who gave the quote was friendly and very helpful. He had pictures of previous installations and helped me easily understand the quote provided. The cost was not that scary. The installation team showed up exactly on time the day they were promised. The installation was smooth. The installers clean up after themselves each day and were very friendly and helpful with any questions that arose during the installation. The end product was exactly what I wanted and really just a great experience. Joe and his team did a great job from beginning to end. Joe explained the options and was highly responsive to my questions before signing paperwork as well as during and after the installation. Joe and the rest of the team at Besco are totally professional, take the time to explain every detail, do impeccable work, and are more than fair with pricing out jobs. I felt completely comfortable and confident when I booked them to do a hot water storage tank repair. Joe even came back a month after the work was done to make sure everything was working properly. As a house manager, I fully endorse them and will continue to use their services in the future! I've been using Besco's service for a few years now, and even have my Mom in the city using them. I have always been happy with their responsiveness, service and cost! I recently commissioned them to install a new Trane furnace and A/C system. They were competively priced with three other high rated Angie's List providers that I received quotes from, so I went with Besco based on my experience. I am not disappointed, and they lived up to all my expectations! Well done Besco!! The staff at Besco Air was always courteous and professional when I was choosing my new furnace and then having it installed. Used Besco recently for a few issues, including maintenance and installation of a new tankless water heater. They were responsive, professional, and did high quality work. Xavier (who is the best BTW) came to my house Nov. 18th for a routine maintenance check up on my furnace. It came to light, my heater exchange was cracked, Xavier took his device around my house to check for "gas". He did find some, which meant I need to replace the furnace ASAP. Keep in my, i have 3 kids under 5 years old...and I was going out of town on Nov. 20th for an entire week with my entire family. Besco was able to come on a Saturday Nov. 19th (next day) to replace my furnace, humidifier and AC unit within less than 24hrs! Do you know a contractor who could do this? They were great and Fidel and Xavier were professional, polite and clean. Great service at a competitive price. Highly recommend! I was very impressed with our new home boiler as well as the installation by Besco. They did a great job. I solicited bids from 5 companies and Joe was the best estimator of all of them. He asked the right questions and spent time going over our needs. Chris did the installation and he is a master craftsman - I can say that because I watched him and questioned him most of the day. His work is really good - clean, tight, professional. Besco has also been very good at the post installation follow-up and Joe made a post installation inspection too, which I thought was impressive. Besco was not the most expensive or the lowest cost, but sometimes you get what you pay for. I believe what we spent with Besco was well worth the cost and I have no reservations about recommending them to others as well. courteous crew good installation, very positive experience. Joe and the Besco team were the utmost professionals and quickly responded to every request. Great in educating the customer and delivering superior customer service. The best!... (and I looked at many for my boiler install). I give them my highest recommendation. I recommend Besco for both service and installation. We called them a few years ago to get our old furnace going again. The service was great, quick efficient and friendly. The problem was explained clearly and solved. We learned why a new furnace was in our future but wothout pressure to buy now. Besco was the obvious choice when we decided we had to get one. Again, our options were clearly laid out, explained patiently and an appointment made to install right away. The work was done to Besco's fine standards. We are very happy with our new quiet and efficient furnace. I have used Besco Air several times, from a seasonal check, to an emergency call, and most recently a new HVAC replacement. Each and every time they have been dependable and professional leaving me with no doubt that they not only know what they are doing technically but also value and care about their customers. It's comforting to know that not only do I now have a brand new AC and furnace but I also have a trustworthy team that I can call at anytime if needed. The technicians were professional, careful with my white carpet and on time. They were efficient with their time during the installation as well. I could not be anymore happy with Besco Air....from the office staff to the technicians. Overall a excellent experience. Besco air is an excellent company. They will go the extra mile for you and their people are what truly separate them from the competition. If you need anything related to HVAC, go to Besco Air first. Joe Pelota and his team were exceptional. The work was on time, as projected and a game changer in terms of comfort and coolness. They are a great team and I highly recommend their work, Bestco is exactly that, Best Company I have worked with for services and well worth the expense. Cannot recommend them higher, Joe is a complete class act and I very much appreciate the effort and enthusiasm to exceed expectations. Just awesome. Besco came to the rescue when my AC broke in 100 degree weather. They were responsive, respectful, and straight shooters -- just what I needed. I could not be more appreciative of their help, patience, and customer service. Really great experience. I was dreading having a new air conditioning unit put on my roof. The guys were very professional, sensitive to my needs and very efficient. It was totally uneventful. Very positive experience. 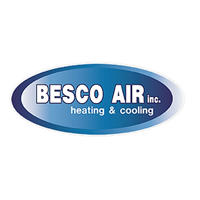 These guys are the best.... From the first call for an estimate to the day the installers where at my house to install the air and furnace I received professional, prompt, courteous and honest service from Besco Air. They are dependable and I know that if I need them to come back for any reason.... I trust that they will make it right no doubt! Ed was amazing and the installers were very friendly and know their stuff. The office staff was friendly and prompt when helping with the utility rebate. All round excellent service. Great service and prices. Came early and fixed my issue quickly. A++ service! Front office immediately responsive & polite when I called this morning to verify our scheduled appointment. Shortly thereafter, the technician called me to confirm he was on the way; he - Sergio Morales - arrived on time. Sergio was knowledgeable, very courteous, efficient and most helpful. His thorough work addressed all our concerns; he went above and beyond my expectations. Besco's level of professionalism allows me to recommend them unequivocally. Thanks, Besco; we appreciate your services! Great first experience! Called 45 mins ahead, as requested, showed up 15 mins early, found the culprit in the steam boiler system (for 3 flat building) within 10 minutes, charged only for diagnostics fee, and provided tips on how to clean the burners myself. Satisfied customer. Service man (Mauro) was very knowledgeable and put my mind at ease when I thought I had an issue with my heater. Besco serviced my furnace on May 5, 2016. They traced an electrical problem from part to part, until they found that the installers of a central AC system failed to remove a jumper in the thermostat which caused it to burn out. Besco replaced and reprogrammed a new thermostat and left a clean work area and at a good price. Good communication, fair price, flawless installation, follow-thru on all details as promised.